Along with Husserl's Ideas and Heidegger's Being and Time, Being Given is one of the classic works of phenomenology in the twentieth century. Through readings of Kant, Husserl, Heidegger, Derrida, and twentieth-century French phenomenology (e.g., Merleau-Ponty, Levinas, and Henry), it ventures a bold and decisive reappraisal of phenomenology and its possibilities. Its author's most original work to date, the book pushes phenomenology to its limits in an attempt to redefine and recover the phenomenological ideal, which the author argues has never been realized in any of the historical phenomenologies. Against Husserl's reduction to consciousness and Heidegger's reduction to Dasein, the author proposes a third reduction to givenness, wherein phenomena appear unconditionally and show themselves from themselves at their own initiative. Being Given is the clearest, most systematic response to questions that have occupied its author for the better part of two decades. The book articulates a powerful set of concepts that should provoke new research in philosophy, religion, and art, as well as at the intersection of these disciplines.Some of the significant issues it treats include the phenomenological definition of the phenomenon, the redefinition of the gift in terms not of economy but of givenness, the nature of saturated phenomena, and the question "Who comes after the subject?" Throughout his consideration of these issues, the author carefully notes their significance for the increasingly popular fields of religious studies and philosophy of religion. 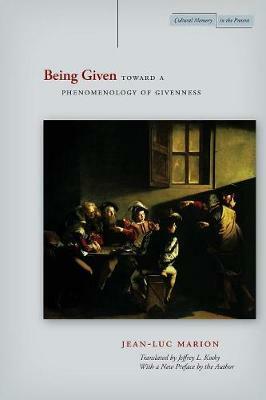 Being Given is therefore indispensable reading for anyone interested in the question of the relation between the phenomenological and the theological in Marion and emergent French phenomenology.